Heat olive oil over medium-high heat. Add the onion, reduce heat to medium and cook, stirring often until soft, approximately 10 minutes. Add the garlic and cook 30 seconds. Add the remaining ingredients and bring to a boil. Reduce heat to medium-low and simmer 8-10 minutes or until thickened and reduced by 1/3. Remove from the heat and cool. Puree in a food processor or blender, then strain through a sieve, pressing on solids to extract as much sauce as possible. Serve sauce with chicken tenders. Season chicken tenders with salt and black pepper. (You may wish to lighten up on the salt as the bacon is salty.) 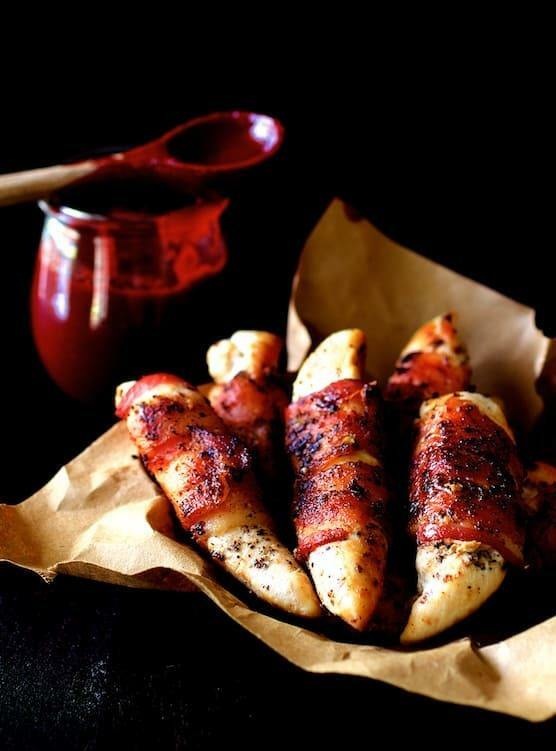 Wrap a bacon slice around each chicken tender. Brown the chicken well on all sides until bacon and chicken are cooked through to 165 degrees.